5"/13cm.Ê Black, red and blue. Ideal for cheeses, spices, citrus rind and even chocolate. Fine, medium, coarse and slicing surfaces. Stainless steel construction and sturdy safe handle. Compact size is perfect for work, travel, picnics, camping and storage.ÊAssorted colors subject to availability. 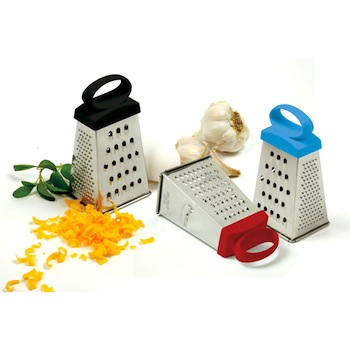 Price per grater.